Artful Affirmations: Tea Cup Tuesday....Already! Your tea cup is just exquisite!! What a treat it would be to drink out of it!! We have great taste in teacups Terri. I have quite a few cups from the same company! They sure were prolific! Beautiful strawberries...makes my mouth water! 'Tis the season for sweet berries, isn't it? 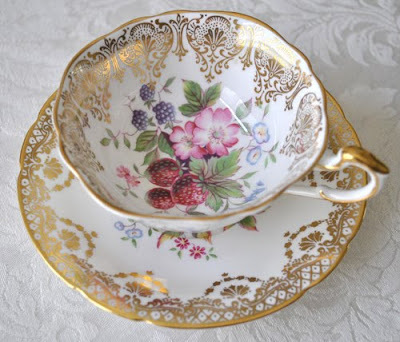 Thanks for a beautiful posting and for Teacup Tuesday! Hi Terri..yay..I always look forward to see what you'll share! GORGEOUS..it is indeed very special! And sooo beautiful!! I bet tea tastes magical in there! !Lovely post! I totally agree with seeing beauty whne you are having one of those "yuck' kind of days can completely turned the day around. I think tha is one of the reasns I love all my different teacups. No matter what my mood is, if I go and pick out a pretty teacup, sit down for a couple of minutes to myself and drink a cup of tea from one of them my day improves immediately. Beautiful, awesome, I love your teacup. What time is tea? Take care... Thinking of you.. 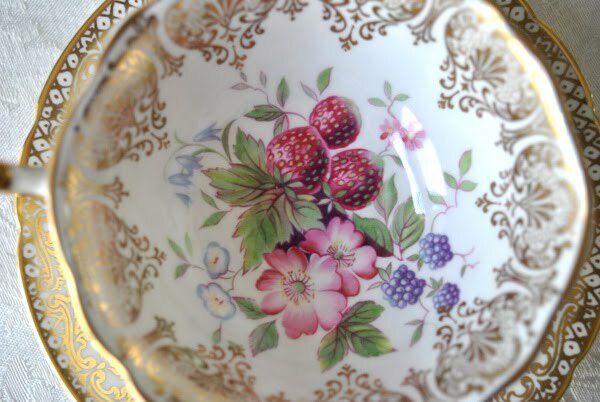 Very beautiful tea cup, Terri! I love your blog and all of your stunning creations, I often visit you to find inspiration. Thank you for sharing your creative ideas! I just love this tea cup the strawberries and blackberries are such a beautiful pattern on the cup! I am finding my strawberries popping up outside I can't wait until they bloom and start producing, they came back from last years first planting. I just invited myself to join Teacup Tuesdays :-) What a super idea for us teacup lovers! Your tuesday treat is in a word GORGEOUS! I've become a follower and look forward to your next delight for the eyes! Beautiful, beautiful tea cup. 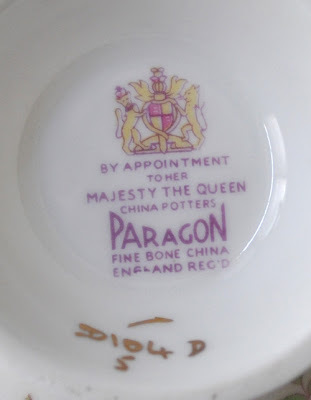 I am really enjoying all the tea cup names and history. Thanks for stopping by my blog and have a wonderful rest of the week. 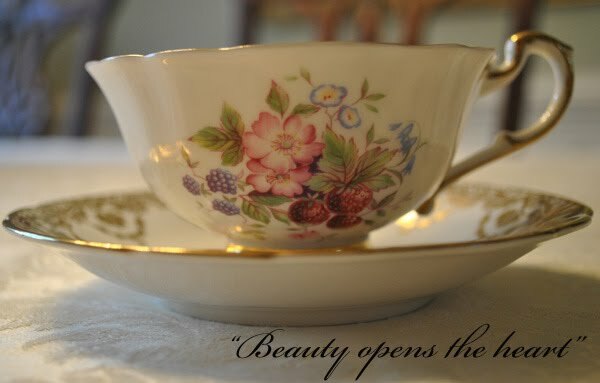 Terri, your teacup is simply exquisite! Thank you for sharing and I hope you have a lovely week. Terri your teacup is so beautiful, how dainty it is. I would love to have tea with that cup for sure. Thank you for sharing. I think its my first visit here and I love your blog! i just watched you shoe video and thanks so much for the inspiration! your paragon cup is simply divine. 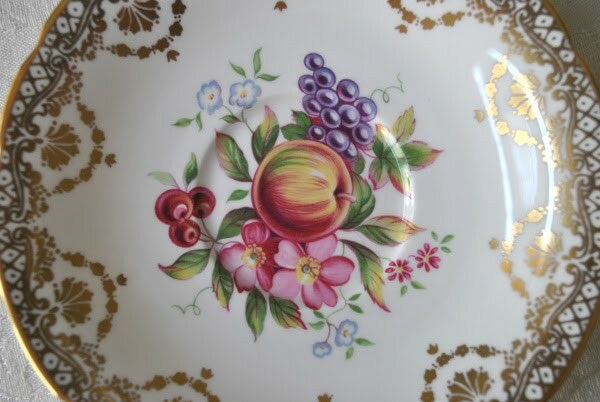 I love nearly all paragon decors, especially floral ones as they are so romantic and feminine that can fill my heart with a sense of great charm. So chic, ne-cest-pas? I'm so glad I could join in the fun of tea cup tuesday and will certainly parcipate again. You gals have been extra nice in welcoming me to this delightful weekly appointment. definitely a day worth looking forward to. I'm so glad I found your blog again. I ran across it before and loved it! I thought I'd followed but I didn't. I am now! I just linked up to Teacup Tuesday as well! Please come visit as I'm having a $100 giveaway!